If you’re not familiar with the story about Tamir Rice, there’s enough information buzzing on the Internet to start a fire right about now. With the holiday season coming up, this unfortunate situation of a 12-year-old child being killed by a policeman may even get a bit more complicated. Due to the holiday season, there will be a lot of people giving gifts. One thing that you know for sure is that some of these gifts will be given to children and teenagers. Some of these gifts might be handgun replicas, very similar to the toy handgun that Tamir Rice was playing with. 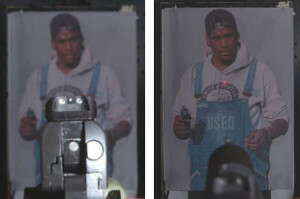 Rice’s toy was replicated to look identical to a real .45. Lately, toy handgun models have been specifically marking these fake weapons to let law enforcement officers know that the replica is a toy. These markers were created to communicate in a very strong visual way so that no one would be confused and react to a perceived threat. The markers are there for protection purposes in order to avoid another Tamir Rice incident. By placing a loud orange color on the tip of the muzzle, the toy manufacturers are doing their part to communicate that their products aren’t real guns. However in Rice’s case, the orange part of the toy had been removed, making it harder for police to see the difference. If you do buy a toy handgun for a family member or friend this holiday season, you should be sure to take out time and explain to the children the importance of these additional features and why they shouldn’t be removed. You should also stress that the toy is something that kids shouldn’t go around pointing at everyone. Teach them to treat the toy as if it were not a toy, and you’re providing a great lesson, maybe one that will lead them to be responsibly armed Americans later on down the line. Have a face-to-face conversation so that you can be absolutely sure that the child or teenager completely understands what you’re saying. Of course, if you can’t be there in person, it might be smart for you to consult the child’s parents first to see if the gift is really a wise idea in the first place. Many parents don’t want their children to have guns, toy or not. The important issue is that of using the tragedy of Rice’s situation to make sure that no more children die. Police should never have to encounter a child with what they believe to be a handgun so that they’re forced to respond. Make sure that all safety features remain intact and that kids understand that you should NEVER point a weapon, even a toy, at an officer of the law. Like many other physical disciplines, there is a commonly accepted way to stand and perform. For basic shooting stances, the most commonly used examples are the Isosceles or Weaver positions to aim and fire. These so-called standardized movements are taught to almost everyone initially. 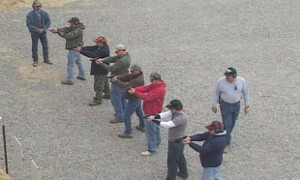 The trouble many shooters run into with these common stances is that the instructor may be teaching with the assumption that the shooter is fully-functional physically and has few or no joint or muscle problems. Few people have perfect bodies without any physical issues and as a result, some people become frustrated with trying to learn the basic positions exactly as they are taught. Some shooters are bent over or have a limited range of motion. Others have arthritis or weak grip strength or something else wrong with them. Naturally, if you aren’t able to draw, aim, and fire your handgun using the basic techniques comfortably, then it’s time to find a method that works for you. Receiving professional instruction or learning from videos and magazines are great ways to start, but then it’s up to you to figure out a way to use your weapon as effectively as possible with the body you currently have. You have to begin somewhere, so there is no harm in starting to learn standardized shooting stances. Yet, if it becomes apparent that these shooting positions aren’t working, the next step is to try variations on what you’re doing until you find something that works for you. Do the best you can with what you have and focus on continuing to improve. The more familiar you become with yourself and your gun, the easier it will become to see better ways to work around any issues you may have. And as always, the basics like having good balance, a solid stance, and good control over the gun are paramount concerns. Otherwise, you run a much higher risk of losing some control. For the sake of argument, imagine what it would be like if you learned to d raw and fire concealed handguns from a very early age. At the same time you learned how to use silverware, button your shirt, and open doors, you would also be practicing and learning basic gun presentation skills. Those acquired firearms skills would become a part of you. These skills would be as automatic as tying shoelaces. Think about it — when was the last time you broke tying your shoelaces down into small steps and bit your tongue as you tried to remember the right knots? Probably not since you were very young. Anyone who learned how to draw a concealed firearm at a young age would have a significant advantage in an armed encounter over someone who didn’t learn. For the early learner, the process would become second nature and require very little conscious thinking about the draw, aim, and firing of the weapon. The point of this theoretical scenario is to illustrate the benefits of practicing your draw and firing skills until they become so automatic that you don’t have to consciously think about the acts themselves, leaving you free to focus on the threat. Since almost no one has learned these skills as children, the good news is that you can pick them up as an adult with the proper application of practice and instruction. Draw speed, fluidity, and smoothness all go hand-in-hand. Be careful of focusing only on getting your gun out quickly. The person who draws their weapon first is not always the winner. The winner is the person who squeezes off the most accurate shot first. Your holster, carry style, and the smoothness of your draw all lay the foundation for that final accurate aim and shot. As you are training and working on speeding up your draw? Try reversing your thinking on the process. Instead of thinking about how you can draw faster, try to identify what is slowing you down. By removing things that slow you down, you can just as effectively speed up your draw. When you consciously make the decision to carry a concealed firearm, you are entering a new state of existence that is quite different from normal non-concealed carrying life. On one hand, being in possession of a firearm leaves you better prepared to successfully defend your own life. On the flipside, you are not even close to having military or police levels of backup, training, and engagement. Soldiers and officers are trained and carry weapons for their jobs and as a result, the jobs come with all sorts of protection. They are allowed to do things that civilians are not. Police are paid to engage, chase, and apprehend dangerous people. They are trained to do these things and hardly ever operate alone. As concealed carrying civilians, it is rarely if ever legal or even a good idea for you to pursue someone. In the course of their jobs, police officers are sometimes required to shoot people. There are reports on the news every week about a police shooting somewhere and details about the resulting investigation. In the event of an investigation, officers involved are usually put on paid leave pending the outcome, given access to mental health counseling, and have legal representation courtesy of their police union. They have far more assistance after a shooting than the common civilian, who can quickly find themselves paying thousands upon thousands of dollars in legal fees. This is before they even have to potentially post a sizable bail. You cannot operate as a vigilante. Your primary reason to carry a gun in the first place is to stay alive. Focus on doing what keeps you alive and out of prison. Most of the time, this means running or getting away in some form or another. This is an oft-mentioned point that bears repeating. Being in possession of a lethal weapon puts you into a much higher tier of responsibility. You must hold your ego in check and abandon all ideas of machismo and tough guy behavior. Missing this critical step is nothing short of courting disaster. Laser Sights: Should You Get One? Laser dot sights are tools that allow you to enhance your low light shooting ability. For times when it’s too dark to see, a laser dot will allow you to see exactly where your firearm is aimed. Laser sights have quite a bit of argument and controversy surrounding them. Some people see them as unnecessary complications and distractions that take away from basic shooting fundamentals. Other people are of the opinion that if the technology works, then why not use it? After all, being able to project a red dot in the dark can give you a significant advantage in some situations. Regardless of how you feel, the fact remains that laser sights should be considered enhancements of your existing skills. They shouldn’t be thought of as a substitute for solid shooting with a pistol that has factory iron sights. Another important thing to consider is the issue of shooting at anything you can’t clearly identify. Of course, no two encounters are the same, but if you are shooting at the outline of a person without being fully able to visually identify the threat, you are taking a huge risk. It is a literal shot in the dark. This is where having a bright tactical flashlight becomes important. A flashlight allows you to illuminate your threat and potential target, and will help remove uncertainties. It will also temporarily blind the other person, giving you the advantage and maybe even the chance to get away. Running is always preferable to sticking around and exchanging shots. 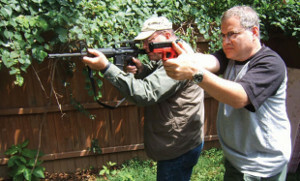 Consider a laser sight to be a tool that can enhance your odds of survival in an emergency. Use it as a training aid and don’t let it become a substitute for basic shooting skills. Batteries can die and unlike the TV remote, you don’t have a couple minutes to change the batteries before carrying on with what you were doing. If you’ve never flown with a gun, you may feel intimidated by the process. You may be worried about getting into trouble by unwittingly breaking some new law, or you may worry that you gun will be lost or confiscated. Fortunately, many people fly with handguns in their checked luggage every day with no issues. Before any trip, it is a good idea to check the TSA (Transportation and Security Administration) website to see if there are any new or updated regulations pertaining to firearms on flights. It’s also recommended to check with the airline you are flying on to make sure you will be in compliance with their regulations, too. The TSA sets a base standard for guns on flights, but some airlines have adopted their own rules that can be more stringent. Flying with a firearm means that you’ll have to check it in a bag. Under no circumstances can you carry the weapon onto the flight, whether it’s loaded or not. When you check in, you must declare your gun to the airline personnel manning the luggage desk. Your choice of words here is important. Don’t walk up to the ticket counter and say, “I have a gun,” and plop your bags down. Say something along the lines of, “I’m traveling with a firearm today,” at which point, you’ll need to show the agent the case the weapon is in. Guns must be in hard cases to be considered eligible checked luggage. Spending money on a good padded case will pay off. If you have any doubts about the sturdiness of your case, just ask yourself if it would stand up to being shipped in the mail. On an airplane, your firearm will be subjected to just as much abuse or maybe even more than it would if you sent it through the US Mail. Other bags will be stacked on top of it, and the case may even be dropped on the ground. You want to be sure that your case can stand up to this rough treatment. The gate agent who helps you may not be familiar with firearms regulations on airplanes. If this turns out to be true, you may have to politely request that a manager become involved. Most managers are familiar with their airline’s firearm policy. If you want some extra peace of mind, it can’t hurt to print off the airline weapons policy directly from their website. This can be presented to the ticket agents just in case they aren’t sure what to do with you and your cargo. Finally, you will want to thoroughly research the gun laws of your destination. You need to check and see if the city and state you’ll be landing and staying in has any strict regulations that cover handguns. Airports you are flying through should also be considered in this research. This is especially true if you must retrieve your checked bags and re-check them with a different airline. At that point, you’ll technically be in possession of your gun and depending on where you are at that time, it may be illegal to have a firearm in your possession. Flying with any deadly weapon will take some extra planning, but it’s not taboo. Make sure to do your homework, comply with local laws both at your take-off point and your landing point. That way, you can have your concealed carry weapon with you and you won’t be confronted with unexpected surprises.